When I was watching Sunny prepare this recipe on tv, she made it look so easy... and it is! The key to this recipe is using either a no taste powder or gel food coloring to get the unmistakable color for the red velvet brownie. You can find it at any baking specialty store or some craft stores that sell baking items. I will admit that the chocolate flavor isn't exactly very strong but you can experiment and adapt this recipe with your favorite brownie recipe by adding red food coloring. Heat oven to 350 degrees. Butter an 8x8 baking pan, set aside. Combine the melted butter with the sugar, vanilla, cocoa powder, salt, food coloring and vinegar, in that order mixing between additions. Whisk eggs in a separate small bowl and combine with warm cocoa mix. Fold the flour into the chocolate batter and combine lightly. Reserve ¼ cup of batter for the top and set aside. Pour the remaining batter into the prepared baking pan. For the cream cheese layer, blend together the cream cheese, sugar, egg and vanilla in a medium bowl. Gently spread cream cheese layer on top of brownie batter in the pan. Dollop remaining brownie batter over the cream cheese layer. Using a skewer, toothpick or the sharp end of a knife, drag the tip through the cream cheese mixture to create a swirl patter. Yum. Yours looks so perfect. Red Velvet is a favorite around here - I'm also thinking of other fun colors to do this in. The texture looks great. These remind me of my favourite brownies with the swirl. Yours look way betterwith the rev velvet. Thanks for the great post. wow i can't wait to try and make this! My mom's favorite is red velvet cake with cream cheese frosting. She's coming to spend Thanksgiving with me and since a cake would be too much for just us, I'll make these for her instead. I know we're going to love them. 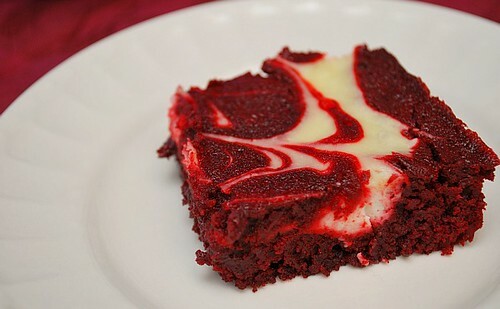 Can this be made with Red Velvet cake mix out of the box, to cut down on time? If so, how can make the cake get the consistency of the brownie? I did the cake mix, it didnt work out! Sorry!